Laminating process in short-term signboard jobs can be omitted. Wider variety of media can be supported by high-density printing with light shielding property. 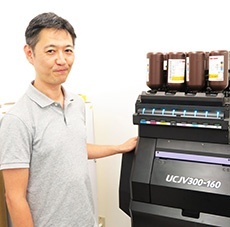 At the introduction of "UCJV300-160", Mr. Itoh, the manger revealed that they had long sought to introduce a UV printer, saying "In fact, we have always admired UV machine." UCJV300-160 is available at approx. 3 million yen with the cut function in addition to printing. This price is much the same as a solvent printer, which was previously unimaginable. says Mr. Itoh. The print speed turned out to be at the level comparable to a solvent printer. Print using high-density white ink, not available on a solvent printer, is another attractive factor, and expands the possibilities for printing on various media. This also backed their decision, and made them carry out machine replacement at the time their previous print & cut machine's maintenance period expired. What impresses customers after introduction is the excellent quality. Mr. Itoh says, "In fact, I have a career in a printing firm, and knew the features of UV printer. I used to think that the tone is reduced and the result is dull in hue with UV compared to solvent. But it isn't like that at all, and colors come out clean. It provides solid film thickness, but the watery ink property produces positive result. I am thoroughly pleased with the quality of its finish." In terms of printed items, displays for short-term use of 1 month or less can be delivered with unchanged texture without laminating, which allows to reduce a process for it. They receive favorable evaluations from their customers like; "UV produces great colors, and gives less damage to vinyl chloride than solvent, which facilitates the applying process without laminating." Such voices prove that the product realizes process reduction and customer satisfaction at the same time. As UV curable ink requires no drying time, users do not have to wait to proceed to the post process, which improved the work efficiency. This banner was full-printed including yellow on a white tarpaulin with a solvent printer. The introduction made it possible to print only letter parts on a yellow tarpaulin, which lead to significant reduction of ink cost. The company receives orders for banners from 1 sheet per lot. For large scale construction, they sometimes print about 50 sheets. The size is basically 1 m x 6 m, but some can be as large as 2.5 m × 12 m.
There were times when the printer stopped in the process of printing large production item, which bothered them very much. UCJV300-160 has had no such troubles, and is providing stable performance. In the case of a banner sized 1 m x 6 m, the required print time is approx. 30 minutes. They basically assume 2 weeks for delivery, but in urgent cases, they sometimes deliver within 3 days after receiving the data. UCJV300-160 is playing an active part in meeting requests for such quick delivery. Existing "JV300-130" is also used in combination. The company has a JV300-130 in operation, which they intended to use as the main machine. 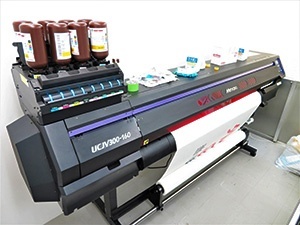 However, UCJV300-160 was promoted to the main machine before they knew it, since Mr. Itoh, favors its color like screen print. 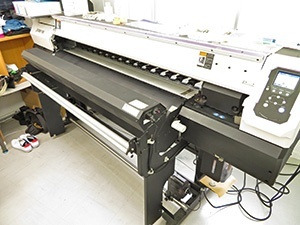 One of its features is "Print & Cut", which enables the machine to serve as a cutting plotter. It's high precision cutting capability allows to cut out the letters accurately even if they cannot be made thicker. If register marks are printed, sheets printed by JV300-130 can also be cut without the need of fine adjustment. They can now cut thick sheets which could not be cut with a 3rd-party print & cut machine they used to use previously. So they highly evaluate the product, saying "We greatly appreciate its cutting capability as well." Their most frequently used media is tarpaulin. Vinyl chloride, which used to be printed with a solvent IJP, is now printed more with UV. Furthermore, they can also handle high-transparency media, taking advantage of the property of white ink. Mr. Itoh says, "When you talk about taking advantage of white ink, you're always talking about printing on transparent media. It also allows us to make good use of letters by cutting them out, which we appreciate." The white ink has a high opacifying ratio, and makes light blue come out clean by applying white base on transparent or colored media. What about works before and after printing? In the case of solvent ink, if someone accidentally touches the media before printing, fingerprints may appear on the portions with ink applied, which used to cause a trouble. This seldom occurs with UV. Also, in the field of post process and displays, excellent adhesion and abrasion resistance of UV ink is highly valued. As banner jobs involve sewing process, there was a concern that letters get scratched during the process. "Scratches used to be easily noticed especially on solid black surface, which are rarely seen now." says Mr. Itoh. He places his confidence in the extremely strong and well-spreading ink. The print quality is receiving a great response from customers who expresses it as "beautiful". It is highly evaluated especially by industries that largely deal in screen printing, which brings a sense of reassurance. Mr. Kimura, President mentions, "We could introduce the Mimaki printer without any worry. We hope to ensure to keep on delivering more excellent printed products to customers. Machines are there to help us realize it. We expect them to be further improved, both in performance and functions." 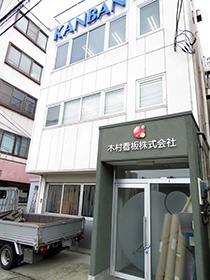 Kimura Kanban started its operation in 1929 as a sign maker with a store in Honjo-Kotobashi, opened by the founder. 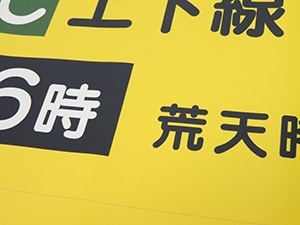 When they started business, they mainly produced hand-painted signboards. Mr. Tetsuya Kimura, the current president is one of the craftworkers who started their career in the age of hand painting. The company introduced a cutting plotter and established the cutting department in 1987. It also introduced inkjet printers (IJP) in late 1990s, and has mechanized its operations ahead of competitors. In Dec. 2017, the company moved on to take another new step by introducing "UCJV300-160", LED-UV curable IJP with print & cut functions. In its inaugural period, Kimura Kanban was recognized for its excellent skills of hand-painting letters, and produced numerous signs for the neighboring riverside fish market of Tsukiji and its surrounding areas. Still now, numbers of signs and display boards produced by them are posted in Tsukiji market. Mr. Kimura, himself has also crafted hand-painted signboards, and even painted images on sento (public bath) walls. The company's current business is centered on print and production of signs and display boards using IJP, cutting of marking films, as well as printing on veneer boards by hand-printing screen prints. In their current business, the most common job is production of "banners". In particular, "Notice of road repairing" posted on the metropolitan expressway accounts for about 80% of it. "UCJV300-160" is making a significant contribution to production of these banners. It was 7 years ago that Kimura Kanban introduced their first Mimaki Engineering product, "JV33", a solvent IJP. 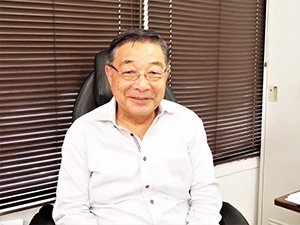 Mr. Mitsuo Itoh, the company's operator and sales manager of Planning and Design Section, looks back on that time; "When we introduced "JV33", we also considered products from other manufacturers. But evaluations of Mimaki and its products we heard from other companies were quite good. After viewing demonstrations and samples, we came to a decision to introduce it." IndustryPlanning, production, sales and paintwork of various types of signs, advertisements, etc.